Film-Arcade.net: Tracey Birdsall and Barry Corbin Enter "The Time War"
Tracey Birdsall and Barry Corbin Enter "The Time War"
Empire Motion Pictures recently released casting information for their upcoming film "The Time War". The film stars Tracey Birdsall, Barry Corbin and Christopher Lee in one of his final role. "The Time War" is slated to come out in 2017. 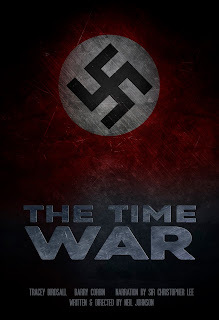 Birdsall, Corbin doing time-traveling Hitler sci-fi THE TIME WAR! Award-winning actors Tracey Birdsall and Barry Corbin are filming The Time War, writer-director Neil Johnson’s long gestating science-fiction thriller that went into development back in 2010. The film features the legendary Christopher Lee (Lord of the Rings, Star Wars : Attack of the Clones) in one of his final screen roles. Birdsall, who this year stars in Johnson’s highly-anticipated Rogue Warrior : Robot Fighter, is a favorite of Neil Johnson. Johnson is also a long-time fan of acclaimed actor Corbin, whose many credits include The Thorn Birds, No Country for Old Men, Norma Raeand TV hits Northern Exposure and Anger Management. For Corbin, it’s a return to the sci-fi genre. The Texas-born actor’s previous genre efforts include such classics as WarGames and Critters 2 and TV’s The Twilight Zone. Birdsall and Corbin worked together on Dawn of the Crescent Moon - which snared the coveted Best Ensemble Cast Award at Action on Film Festival, rapidly becoming one of the most reputable independent film festivals in the world. Filmmaker Johnson was so sure that the film would get made one day that in November of 2010, he paid Sir Christopher Lee to record an opening narration while at Abbey Road studios on other business. Johnson didn’t realize that this would be the last time that he would see the acclaimed actor, who passed in 2015. "Mr Lee had killed a number of Nazis during WW2, so it was very apt that the great Nazi Hunter gave his great talent to this wonderfully unique film,” said Johnson. Additional casting to be announced.